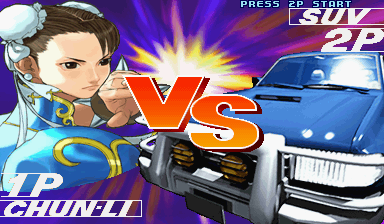 Play Street Fighter III 3rd Strike: Fight for the Future (Euro 990608) online with Arcade browser emulation for free! 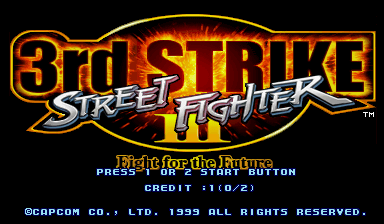 Street Fighter III 3rd Strike: Fight for the Future (Euro 990608) (MAME) game rom is loaded with features in our flash, java and rgr plugin emulators. Nothing to configure, we've done it for you! *unzips* The game aint over yet buddy! 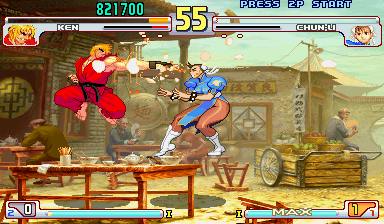 Street Fighter 3 is a great installment in the Street Fighter series and is considered by some to be the finest in the series, though what some love about it may turn others toward other options. I would argue it is less accessible than it could have been, though by requiring a lot of skill to get deep into the game, they inspired a lot of die-hard SF3 fanatics. 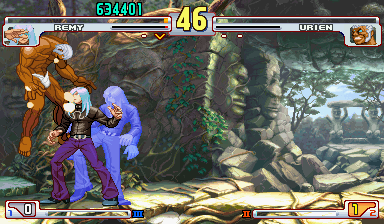 Street Fighter 3 is the sequel to the uber-famous SF2, 3rd Strike is the 3rd iteration of the SF3 series. 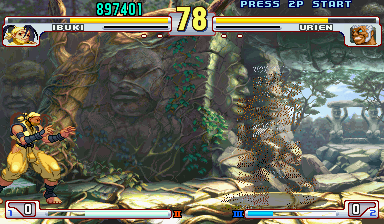 SF3 was not released (at least not immediately) to any of the most popular gaming platforms of the time which is part of the reason why it is less known to home gamers than SF2 or SF4. Also, while SF3 did not initially focus on nor include many of the returning and beloved main characters, SF3 introduced a new main character. 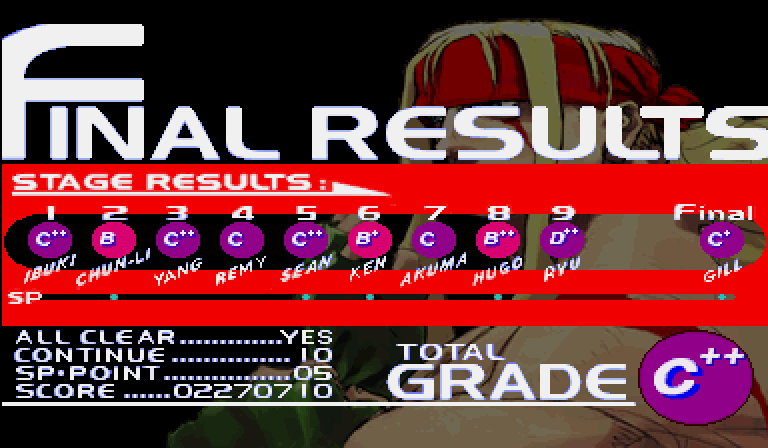 The main protagonist of the first SF3 Fight the Future was Alex, a "grappler" character who specializes in throwing his foes. 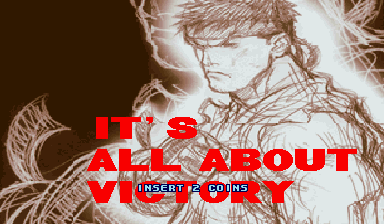 Ryu had been the main character of all previous and future Street Fighter games (unless you count the Guile-centric "Street Fighter the Movie" lol). Additional characters from the SF2 roster were introduced as SF3 got its updated versions but the impression that this was a different sort of Street Fighter had already been made. Finally, unlike SF4 that simplified the inputs that the game accepts as a special move allowing for sloppier inputted commands and more casual gamers access to advanced techniques and strategies, SF3 while upping the complexity of combos and things over SF2 required precise inputs to trigger the special moves, perhaps further distancing casual SF fans while appeasing fighting game elitists who feel success in the game should be earned by devoted study. That all having been said, the game is top-notch quality. 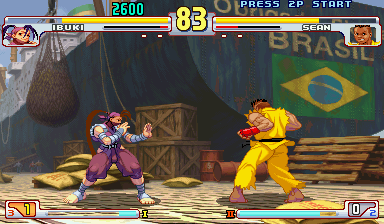 A huge improvement over SF2 and even the Alpha series, people used to either of those prequels will instantly notice the high frame rates of all the varied, interesting-looking characters. For example, Makoto the karate girl goes through tons of frames of animation just walking as she takes slow and deliberate steps. 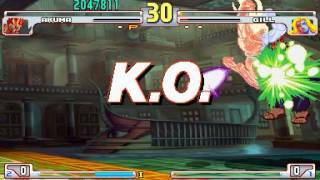 The smooth animation, huge numbers of moves and beautiful backgrounds add up to one of the prettiest 2d fighters prior to the introduction of 3d graphics to the series in SF4. The soundtrack is great with what I am guessing is a hip-hop/rap and/or techno inspired soundtrack that wins points for being new and different for the series but fits the consistent mood of the game surprisingly well. The killer musical tracks are in addition to all the vocalizations of the fighters to accentuate their moves and/or pain and the announcer is great as well. Each character has tons of moves and tons of strategies to employ, since each character must learn which of his moves defeat the moves of each "match-up" or each opponent he must face. Characters can use "normal" attacks, special attacks, combos (chained together normal and or special moves), the introduction of EX moves (trading some built up special-move meter for extra powerful special moves with various souped-up properties), giving not one but 3 different super-combo options (powerful automatic combos that can be unleashed with a full power-bar)... all this adds up to a very deep experience that takes a lifetime to master, literally. I gave the addictiveness score a break though I could have graded it down a bit since the learning curve is a bit steep, it could turn away beginners before they really have a chance to get into the game. 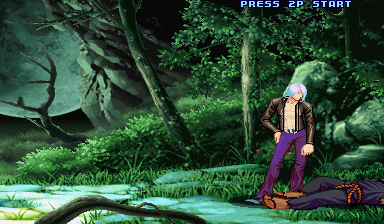 The story in Street Fighter is good though a bit shallow. Each character has their own reasons for fighting and so you may choose your character based on curiosity to see how it unfolds particularly in their ending. I gave it a 9 for the aforementioned depth and steep learning curve, and the computer AI can get vicious (though if you take them down your fellow humans can get even worse). It could have been difficult in a more frustrating way had the play control not been so good. The challenge here is purely of the enjoyable variety. So happy to see this great fighting game on Vizzed! It's sad that the CPS3 only got 6-7 games. Kingofbadgames, does the legal info show? like it saying "Street Fighter III third strike" when you started up then showed a black screen? If that is so, then go to the service menu, then reset everything, it'll take about 20-30 minutes. That CD start-up sequence, I LUV EET! Playing this always makes me think of Daigo and Justin. Sean is my Favorite character in the game, but I'm so sad to hear he is like and sorta the new Dan Hibiki. Dan is known as a joke character and is the weakest character. His moves and taunt is somewhat stupid and weak character like and is very arrogant. all 6 attacks are in the game. you need to set your controls correctly! If this does not work for you try something else remember its what your comfortable with so you should give it so time so you can get use to it. this is my config. up= w down= s left=a right=d jab= k strong= i fierce= o short= j forward= L roundhouse= u You don't have to configure it exactly as I did but make sure the movements are on the left and the attacks on the right.